I have to say I am very sad that summer has come to an end. It was great while it lasted. It slowly tip-toed in…and then quickly went out with a bang. Literally. A big one. 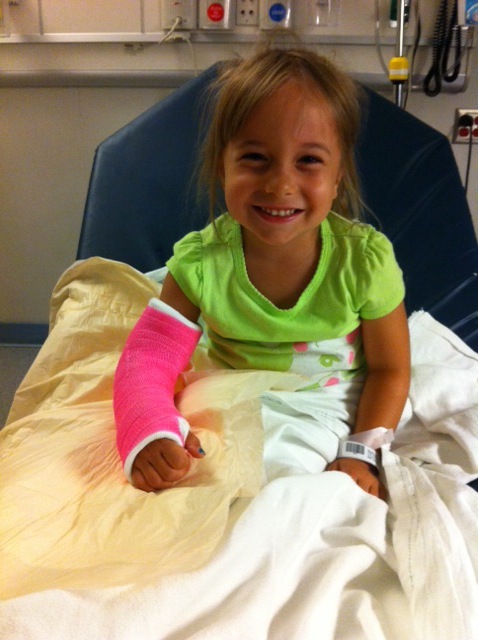 “I think Kaiya might have broken her arm”. Let me tell you, this is not the phone call you want to receive at work. Not to mention I work 45 minutes from the daycare. I’m lucky there weren’t any cops out that day, because I drove about 85 MPH to get to her as quickly as possible. 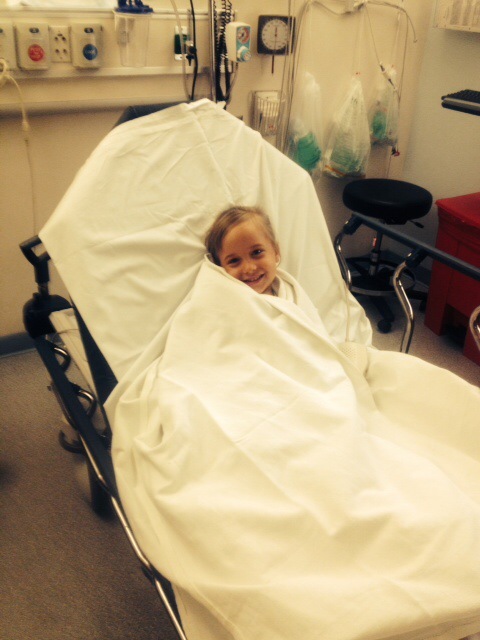 Miss Bean took a nasty spill and managed to break both forearm bones in her right arm. She fell victim to a very innocent looking octopus merry-go-round. Who would’ve known that a Little Tikes toy could do so much damage. When I saw my baby, she was laying down and very quiet- which is not the norm. She told me she felt her bone touch her skin when she fell. Yuck! I looked at her forearm and it was concave. I made the mistake of calling her pediatrician’s office, who told me to bring her in for an evaluation to determine if she needed x-rays. I should have said “An evaluation??? My child’s arm is bending in the wrong direction!! !” Note to self: next time go straight to the emergency room. 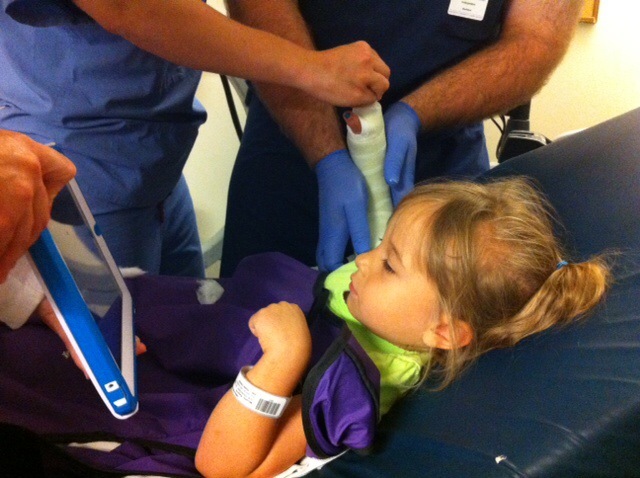 After 8 hours of sitting in the doctor’s office, then the hospital for x-rays, and then the emergency room of another hospital, my baby was finally released with an arm weighing about 5lbs more than when she came in. 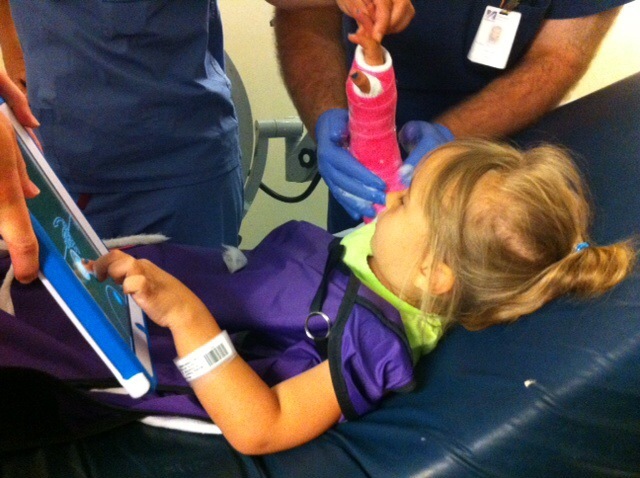 All I can say is, thank God for the iPad and that they were able to give her a pink cast! Now the fun part- trying to keep it dry.